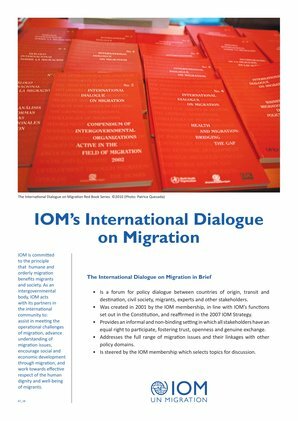 Building on discussions held during the first session of the 2018 IDM which took place in New York on 26 and 27 March (Inclusive and innovative partnerships for effective global governance of migration), this second session elaborated further on the overarching topic of partnership and cooperation with a focus on capacity development to meet the current challenges of effective governance of migration. Developing and delivering capacity development requires the participation of a wide range of actors – including governments and local authorities and international and regional organizations – and the formulation of different activities, focused at different levels and different areas of action. The event provided a platform for exchanging examples of capacity development instruments and partnerships among a wide range of stakeholders, including high-level government representatives, leading UN actors as well as senior regional actors, intergovernmental and non-governmental organizations, diaspora representatives, and the private sector. The session was a timely opportunity for the participants to evaluate best practices of whole-of-government, whole-of-society and UN system-wide coordination approaches to support migration governance ahead of the Intergovernmental Conference to adopt the Global Compact for Safe, Orderly and Regular Migration, scheduled in Marrakech, Morocco on 10 and 11 December 2018.